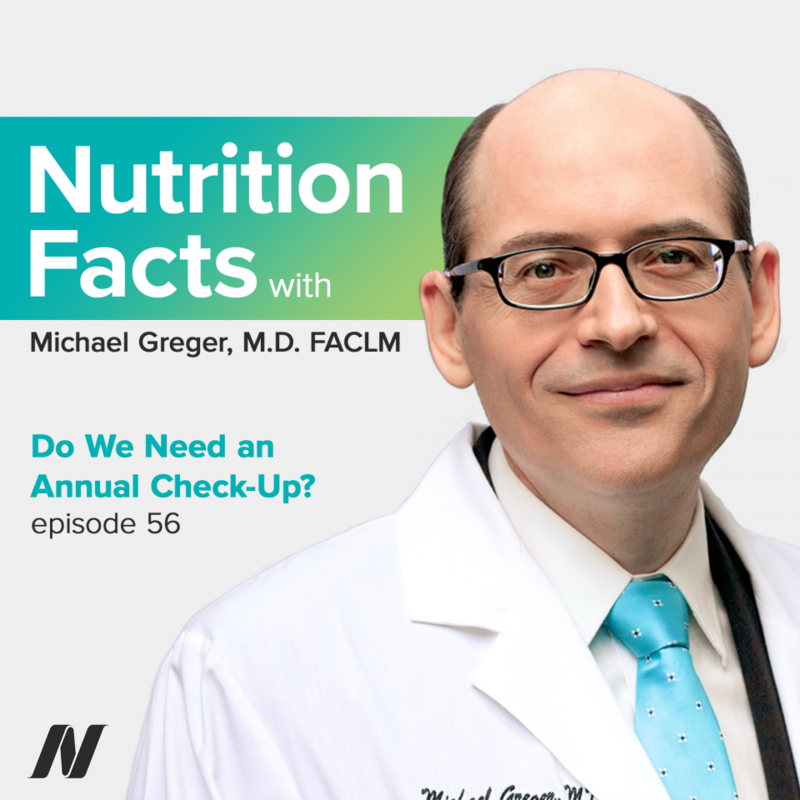 Dr. Greger looks into the risks and benefits of getting an annual check-up. This episode features audio from my Is it Worth Getting Annual Health Check-Ups? and Is it Worth Getting an Annual Physical Exam? videos. Visit the video pages for all sources and doctor’s notes related to this podcast. We check lots of stuff regularly–our cars, our bank accounts, our Facebook and Twitter. Today, we’re going to look at the risks and benefits of getting an annual medical checkup for our bodies. Here’s the story. “We check our cars regularly, [though], so, why shouldn’t we also check our bodies…”? Well, unlike cars, our bodies have “self-healing properties.” To see if the benefits outweigh the harms, researchers decided to put it to the test. “Possible harms from [checkups include] overdiagnosis, overtreatment, distress or injury from invasive follow-up tests, distress due to false positive test results, false reassurance due to false negative test results, possible continuation of adverse health behaviors due to negative test results, adverse psychosocial effects due to labelling, and difficulties with getting insurance” now that you have a pre-existing condition—not to mention all the associated costs. For example, diabetes. Wouldn’t it be great if we picked up a case of diabetes earlier? Perhaps not, if they were given the #1 diabetes drug at the time, Avandia—which was pulled off the market because, instead of helping people, it appeared to be killing people. “Adverse drug events are now [one of our] leading causes of death.” When it comes to lifestyle diseases, like type 2 diabetes, maybe we should instead focus on creating healthier food environments—like my new favorite organization, Balanced—to help prevent the diabetes epidemic in the first place. How many times have you tried to inform someone about healthy eating, about evidence-based nutrition, only to have them come back and say, “No, I don’t have to worry. My doctor says I’m okay. I just had a checkup; everything’s normal.”? As if like having a normal cholesterol is okay in a society where it’s normal to drop dead of a heart attack—the #1 killer of men and women. I mean, if you went to see a lifestyle medicine doctor who spent the checkup giving you the tools to prevent 80% of chronic disease, that’s one thing. But given the way medicine is currently practiced, it’s no wonder, perhaps, why “[t]he history of routine check[up]s has been one of glorious failure, but generations of well-meaning clinicians [just don’t want] to believe it….Policy should be based on evidence,” though. “Poor diet” is on par with cigarette smoking as the most common actual cause of death; yet, the medical profession is “inadequately” trained in nutrition. Worse, nutrition education [in medical school] appears to be in decline,” if you can believe it. A “shrinking” of nutrition education among health professionals. So, the advice you get in your annual checkup may just be from whatever last tabloid your doctor skimmed in the check-out line. “[S]creening [opportunities] should not be regarded as a form of ‘health education,’” one medical journal editorial read. “People who are obese know very well that they are, and if we have no means of helping them…, then we should [just] shut up.” Well, if you really have nothing to say that will help them, maybe you should shut up—especially doctors who say they “have no idea what constitutes a ‘healthy’ diet,” though veggies and nuts are a good start. “But rather than performing unnecessary [or worse] exams…and…tests, perhaps physicians should spend some of the time saved by telling their patients why they are not” going to just go through the motions, like some witch doctor. This Cleveland Clinic doc shared a story about his own father, who went in for a “checkup.” Can’t hurt, right? The doctor thought he felt what might have been an “aortic aneurysm;” so, “ordered an abdominal ultrasound.” Can’t hurt, right? Aorta was fine, but hmm, something looked “suspicious” on his pancreas; so, “a CT scan” was ordered. That can hurt: lots of radiation. But thankfully, his pancreas looked fine. But hey—what’s that on his liver? Oh, for goodness sake. Looked like cancer, which made a certain amount of sense, having worked in the chemical industry. So, realizing how ineffective the treatments were for liver cancer, he realized he was going to die. The daughter was not ready to give up on him, though; “convinced him to see a specialist.” Maybe, if they could cut it out, he could live at least a few more years. But first, they had to do a biopsy. And, the good news was, no cancer. The bad news, though, it was a benign mass of blood vessels; and so, when they stuck a needle in it, “he almost bled to death.” Ten units of blood is like all you have. Pain, and so morphine, and so urinary retention, and so catheter; yet, thankfully, no infection. Just a bill for $50,000. “The frustrating thing” is that the whole horrible sequence wasn’t like malpractice or anything; every step logically led to the next. “The only way to have prevented this [life-threatening] outcome would have been to dispense with [that] initial physical exam”—the one that couldn’t hurt, right? Well, “Why, then, do we continue to examine healthy patients?” Well, first of all, it’s because “we get paid to do it.” His dad’s initial doc only got a hundred bucks or so, but just think of all that “downstream revenue” for the hospital and all the specialists. Overdiagnosis is big business. Yes, “Too many patients bear the costs and harms of unneeded tests and procedures,” but without annual checkups, we doctors would miss out on all those opportunities for “open communication and interpersonal continuity.” To which one physician replied: Look, if you’ve deluded yourself into thinking you’re doing more good than harm, if you want communication, why not just take your patients out to lunch or something? “Of course, such lunches should fairly and ethically be preceded by an informed consent discussion that allows prospective diners to understand the risk that they may be [patronized to], and may well receive unnecessary and injurious…interventions as a consequence of that grilled cheese and soup”—particularly, I would add, if you’re feeding your patients grilled cheese, having already chalked up your first such unnecessary and injurious act. I like the podcast format. Longer, but not too long to focus on it. Pondering this and how it correlates even to the mammogram over diagnosis problem. I am not personally affected by any of it, because I opted out from medical care for 30+ years. I also opted out of nutrition during that time, and probably would have gotten lots of diagnoses, but instead, I just slowly took my time steering my ship into my current direction. Very, very slowly. It doesn’t feel like skipping all the tests when I was younger harmed me, but I do wonder if there is a certain age when the odds would change by going and actually getting diagnoses? Or is it really just show up in the medical system through the ER someday? I am attempting to have it be that way. The fact I may have gone from no medical care heading toward my late 50’s tells me that I skipped a lot of lab tests and scrutiny. Feels like, if I went right now, they would start trying to figure out which med to get me to go on. I think after a year of this eating process, maybe I could get some labs done from an on-line place and a thermogram from the spa nearby?